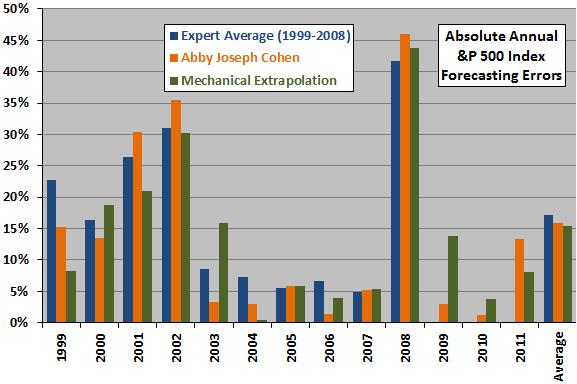 For 1999-2000, Abby Joseph Cohen’s forecasts are not particularly accurate, but they were more accurate than the expert averages. In 1999, her forecast is too low; in 2000, too high. For 2001-2002, her forecasts are especially inaccurate (dramatically overoptimistic). For 2003-2007, her forecasts are fairly accurate, mostly beating the expert averages. For 2003-2005 and 2007, her forecasts are a little too high. For 2006, her forecast is slightly too low. For 2008, her forecast is dramatically too high. For 2009-2010, her forecasts are fairly accurate. For 2011, her forecast is not very accurat. Note that the “Average” columns use data only for 1999-2008 because Business Week discontinued analyst forecast surveys after 2008. There is slight evidence that Abby Joseph Cohen is more accurate than the average expert and about as accurate as a simple algorithm. During 1999-2008, her average annual absolute forecast error is 15.9%, compared to 17.1% for the expert average and 15.1% for the simple mechanical extrapolation. During 1999-2011, her average annual absolute forecast error is 13.6%, compared to 13.8% for the simple mechanical extrapolation. Sample sizes are very small, so confidence in relative accuracies is very low. There is stronger indication (11 out of 13 years) that Abby Joseph Cohen’s forecasts tend to be too high rather than too low. In summary, very limited evidence suggests that Abby Joseph Cohen is a little better as a stock market forecaster than her average peer, and about the same as a simple algorithm. For comparability with the methodology used in Guru Grades, we also collect a higher frequency sample of Abby Joseph Cohen’s U.S. stock market forecasts since late 1998 to include intra-year revisions and assign subjective binary (right or wrong) grades to each forecast. The table below summarizes these forecasts and shows the performance of the S&P 500 Index over the 21, 63, 126 and 254 trading days after the publication date for each item. Red plus (minus) signs to the right of specific items indicate those that the market has subsequently proven right (wrong). Forecast sample is moderate, as is therefore confidence in the measurement of her accuracy. Media attention to Abby Joseph Cohen’s outlooks appears to vary such that the sampling frequency varies, thereby potentially introducing some bias. See Guru Grades for a snapshot of the accuracies of other experts in forecasting the U.S. stock market, including links to evaluations of individual gurus.